Calvin Klein will launch the annual limited edition summer versions of 1988's Eternity and 1989's Eternity for Men in March. 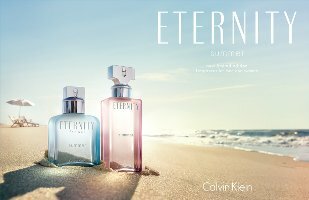 Eternity Summer 2014 ~ a green floral evoking the peace and serenity of a day at sea, with pear, tangerine, watermelon, bamboo leaves, peony, water lily, gardenia, neroli, gentle musk and white woods. In 100 ml Eau de Parfum. Eternity for Men Summer 2014 ~ a fresh fougère capturing a relaxing day on the beach, with juniper berry, pear, basil, watermelon, cardamom, lavender, thyme, amber, sandalwood and musk. In 100 ml Eau de Toilette.